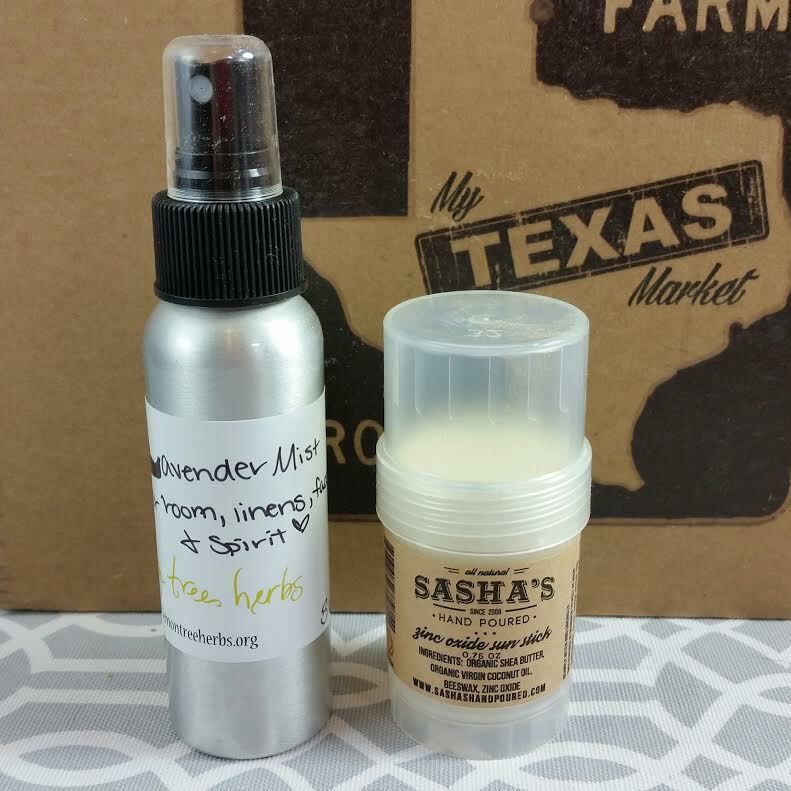 My Texas Market features Summer Road Trip Essentials in their June 2016 box. I definitely wished this had arrived before we left because I would have taken every single thing with me! 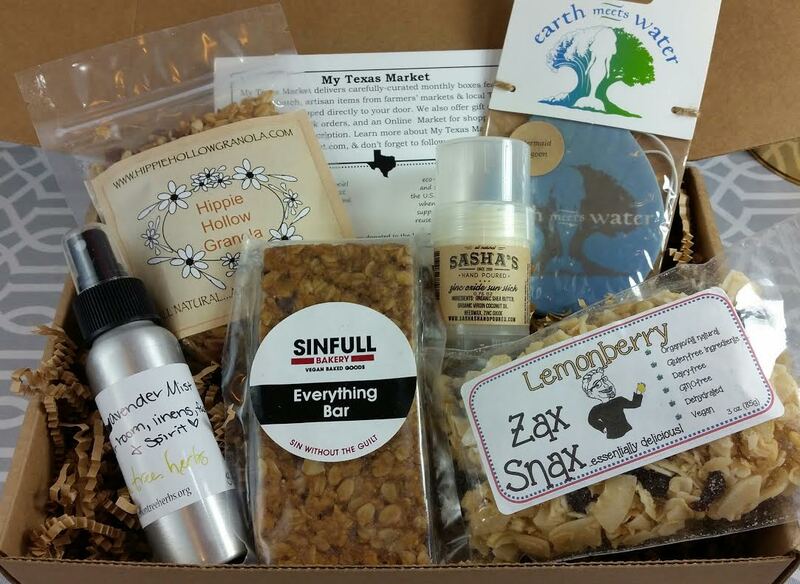 My Texas Market sends small batch, artisan items from farmer's markets and local Texas businesses. It's a great way to get a taste of Texas without having to leave the house. It's also a LOT of fun. Zak Snax Lemonberry Snack Bag- This is made with organic coconut, cranberries, cashews and lemon essential oil. Needless to say, it's absolutely fantastic. I'd save it for our next road trip but it's way too good. Nomnomnom. If you live in Houston, find the Farmers Market and snag some for yourself. 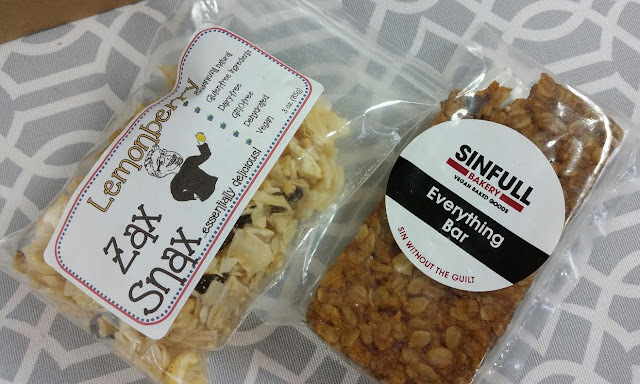 Sinfull Bakery Everything Bar- This is fabulous! It's soft and chewy which is my favorite texture for granola bars similar to this. It's made in Houston and is completely vegan. This has pecans, agave, almonds, oats, cranberries, raisins, flax, etc etc. It's SO good! If you find the Urban Harvest Farmers Market in Houston stop by Sinfull Bakery. Especially if you're vegan since they are a certified vegan bakery. Lemon Tree Herbs Lavender Mist- A mist made of lavender which can be safely sprayed on oneself, linens, around the room or to freshen up your tent. While I didn't take this specific spray (it is lavender, after all), I did take a similar type and it was so nice to have a nice smelling tent. Especially after it rained for two days. Sasha's Hand Poured Skincare Zinc Oxide Sun Stick- This is a fragrance free sunscreen stick made from ethically sourced natural and organic ingredients. Zinc oxide is my favorite form of sunscreen since it's so gentle. I used this already and it's moisturizing, too, with the coconut oil in it. Plus it didn't turn my skin white. 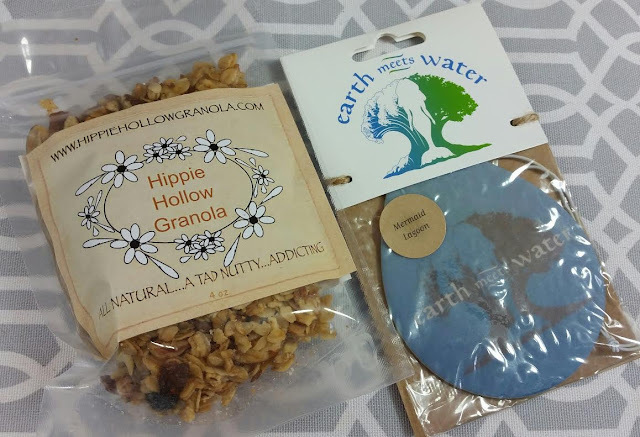 Hippie Hollow Granola Snack Bag- Crunchy, nutty granola mix with honey. Easy to toss in a bag and take with you no matter where you're going. Personally, I think I'm going to pour it in milk and make it breakfast tomorrow. Earth Meets Water Mermaid Lagoon Air Freshener- I laughed when I saw this because it was so unexpected yet fit the Road Trip theme so perfectly. This version is scented with Moon Flower & Awapuhi Seaberry. I have no idea what either of those smell like individually but this smells very fresh, light and clean. As a bonus this month, My Texas Market has teamed up with Texas Highways Magazine. Subscribers will receive a Texas State Travel Guide, a Texas Wildflower Guide and an Events calendar via regular mail. Sounds like a great way to help plan a trip through the Lone Star State! VERDICT: Farmers markets are one thing I especially love about summer. I love getting hand made products and supporting hardworking artisans. My Texas Market regularly features products found at local farmers markets which I love. This is a specialty box that goes above and beyond to find high quality, truly tasty items that you will not find anywhere else. The only sad thing is that it can be nearly impossible to get more! If you would like to sign up for My Texas Market, you can do that here. Use code 10FIRST for 10% off your first box.